American Friends Service Committee is excited to be working alongside long term residents in Peoplestown, Mechanicsville, Summerhill and beyond in an effort to build and strengthen tenant associations in low income apartment complexes. Atlanta is many decades behind other cities it's size when it comes to a culture of tenant associations and tenant rights. 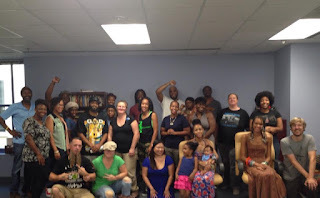 For over a year we have partnered with Peoplestown Revitalization Corporation, Occupy Our Homes Atlanta, and a number of other community groups to build the SMP(Stands for Summerhill, Mechanicsville, and Peoplestown) Housing Justice Movement. Last month with the help of Right to the City Alliance we launch a monthly training curriculum specifically for tenant leaders designed to help them build and strengthen tenant associations in the area. Mass displacement is a dynamic problem that happens when communities are developed too fast. It's not a simple problem, and there's not one way to combat the issue. One way mass displacement happens is the destruction of low in complexes, but with strong tenant associations residents can fight back and in some cases force owners to sell the property to tenants at a fair current market price. 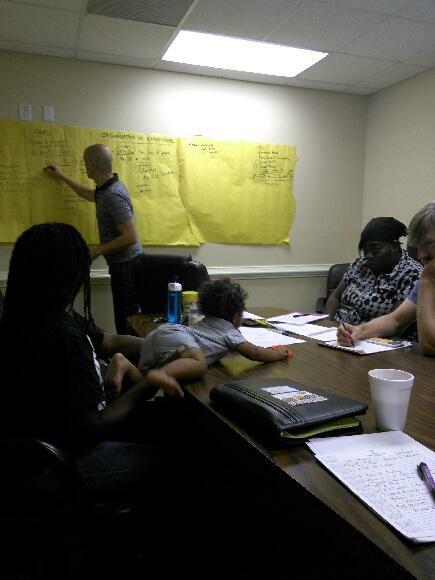 We've already had some success and we're really excited to be working with a new group of strong emerging tenant leaders in the area! Right now the project could use support. One way you can support this important work is by making a contribution of any size to our fundraising drive by clicking here! 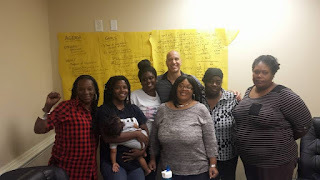 This past Sunday American Friends Service Committee had the pleasure of working with the Atlanta chapter of Zulu Gatekeepers to facilitate a community organizing 101 workshop. 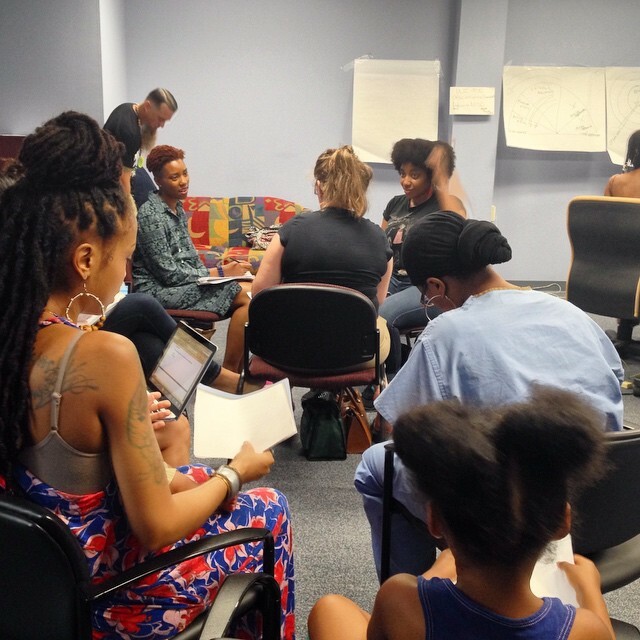 Participants learned the basics of how to build a new group, develop and launch an issue based campaign, identify allies, and build power in Atlanta communities. The turnout and energy was so great that we have decided to start offering regular organizing workshops again in partnership with Zulu Gatekeepers. Workshops will focus on base building strategy, media messaging, the art of activism, and campaign development. 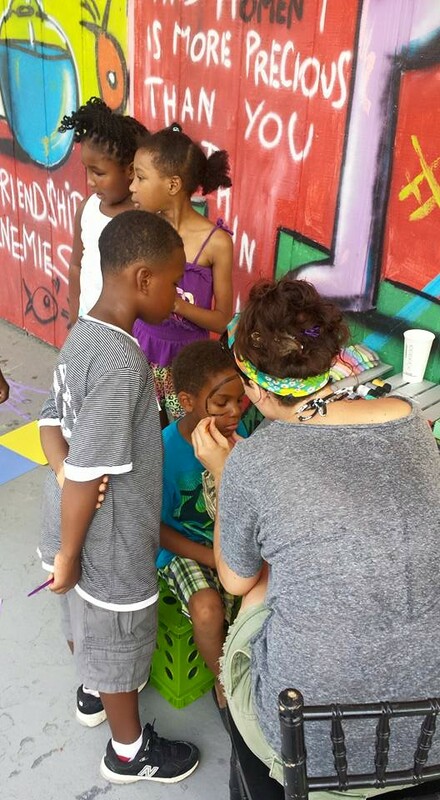 We will work to keep workshops free to community member's and grassroots organizations. Community Day! 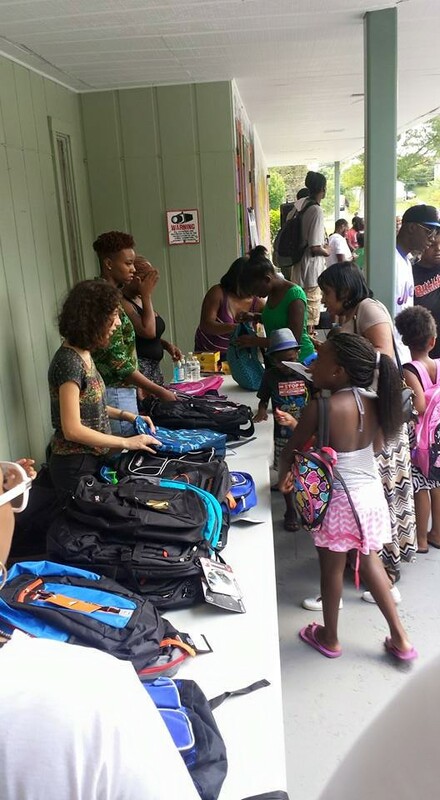 Giving Back While Buiding Forward! What happens to Turner Field once the Braves leave has been a hot topic in Atlanta. Will that land become a Casino, will new stadiums replace Turner Field, will an Atlantic Station type development go down? One thing that’s for sure is that the communities surrounding Turner Field can’t afford another development project that benefits a few well connected folks while further cutting off and displacing long term residents that have been living here long before it was cool to move into the area. We need strong, organized communities to make sure that development that happens in the area benefits those that have been holding down the community for years, but we also need to have time to relax and enjoy each other, to enjoy the community we love! 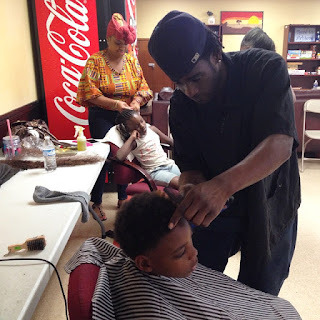 Building a movement takes a lot more then neighborhood meetings and strategy session. Active base building should include cultural events, house parties and other social events that bring people together. Our giant home defender pledge! Slip n Slide was a hit! 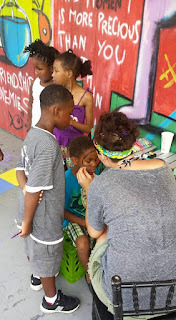 This past Saturday we had the opportunity to work with community partners to do just that. Community Day brought hundreds of residents together at Four Corners Park in the heart of beautiful Peoplestown. Although the event is in Peoplestown it's a celebration of all the amazing Atlanta neighborhoods south of I-20. 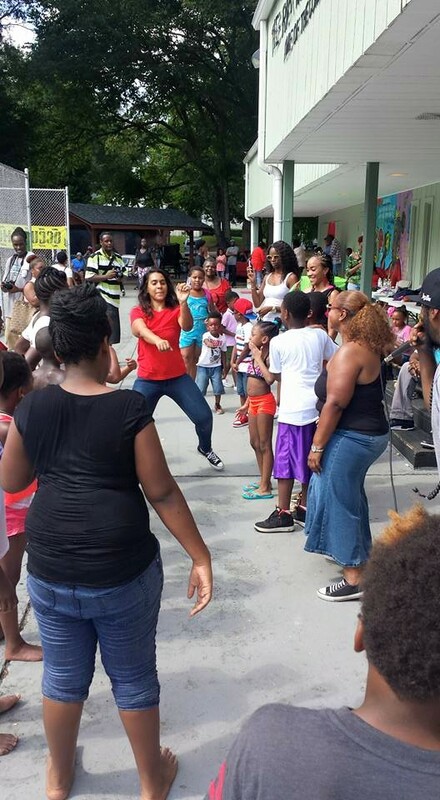 Families came out for an afternoon filled with music, entertainment for the kids, community education, and lots of give aways! 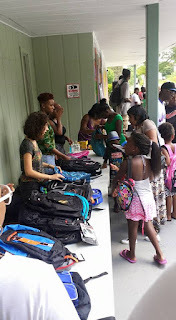 With the help of the J dillaFoundation and a ton of local businesses that volunteered to put out donation boxes we were about to give out close to 300 back packs filled with school supplies and dental packs! 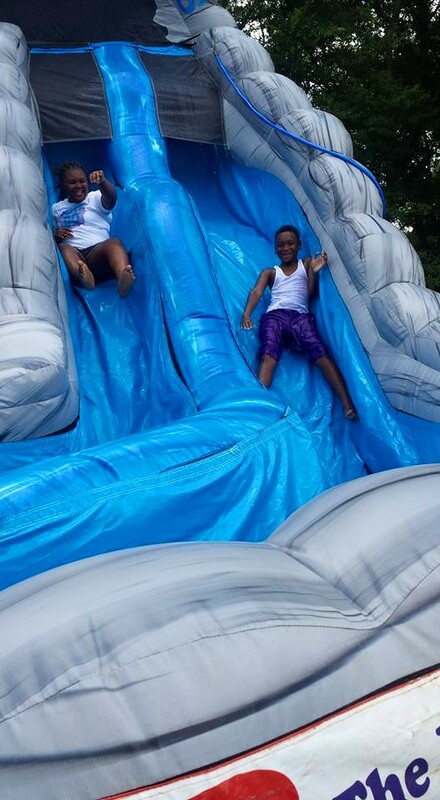 We also had music all day, food for all, a slip and slide for the kids, free ice cream, and a whole lot more. 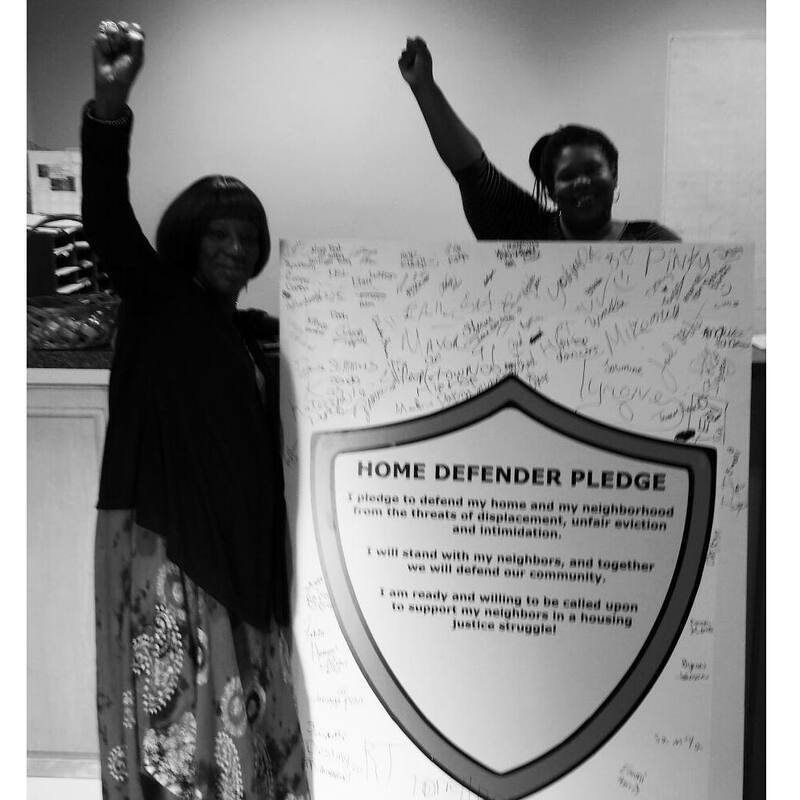 In an effort to bring more residents into the movement to protect, improve, and expand affordable housing we asked folks to sign the pledge to defend their homes and the homes of their community member, hundreds signed the pledge! We’re excited to continue to work closely with the newly formed resident led SMP Housing Justice Movement and Occupy Our Homes Atlanta as the lead the way in the fight to stop mass displacement in the Turner Field area. 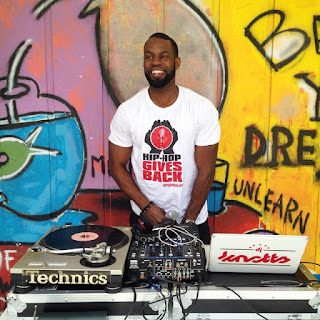 Hop Hop gave back all day! 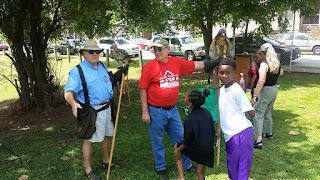 We even had live hawks!